All surgery patients will have a pre-surgical visit to answer any questions you may have and to verify the procedures being performed. We are happy to provide estimates for your pet's procedure because clear communication is important to us. At the time of drop off, which is between 7:30-8am, a technician will meet with you to fill out a surgical consent form and take extra time to make sure to answer any questions or concerns you may have. We know anesthesia for pets can be scary and intimidating but here at Herndon, we do everything we can to keep your pet safe. 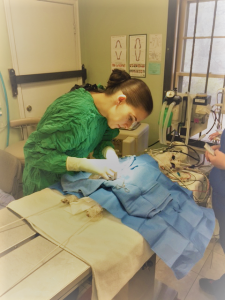 After surgery, the attending technician will call you to let you know when your pet is out of surgery and in recovery. They will also set up a go home time for your pet and send you a text picture of your pet in recovery. -The morning of surgery we will provide a thorough pre-anesthetic examination performed by a doctor. We will check your pet from head to toe to make sure your pet is healthy enough for the anesthesia. -Blood work will be done the morning of surgery to check your pets organ functions. Doing this will also help us select an anesthesia protocol for your pet, and provide a baseline if your pet were to ever become extremely ill.
-Your pet will have an IV catheter placed after sedation medications are administered to make sure your pet is relaxed. The catheter will be there before, during, and after surgery. This provides us emergency vein access if it's needed, and allows us to administer IV fluids to help maintain blood pressure during surgery. Your pet will be given fluids through a pump that allows us to give precise amounts, and allows us to change the fluid rate if needed. - Your pet will be provided with a pain relieving injection before surgery. Studies show that pain control is much more effective when started before a procedure. Certain pain relieving injections will also limit the amount of anesthesia we use, which is a safety benefit. -During surgery, your pets vital signs will be monitored closely the entire time by a veterinary technician and an electric patient monitor. The monitor will be attached to your pet and constantly monitors heart rate, ECG, respiratory rate, temperature, the amount of oxygen in the blood, and blood pressure. Manual vitals are also taken, and are charted on paper every few minutes. -Your pet's body temperature is monitored and controlled during the whole procedure. Pets lose a lot of heat during surgery due to not being able to shiver. Hypothermia can cause slowing of the heart, or a slow anesthetic recovery. Due to this, it is imperative that we provide heat for our surgery patients. We use a warming device paired with warm IV fluids, blankets, and towels. This will keep your pets temperature normal during surgery. -The surgical packs are all sterilized separately for each patient. We do not use the same pack on multiple surgeries. We use an autoclave to disinfect all surgery instruments. -Pain management is very important to us, and we will send home pain medications after a surgical procedure if we feel it is in the best interest of the pet. Pets don's show pain like we do and pain delays healing. We want a speedy pain-free recovery for your pet. If you have additional questions, please contact us by phone 316-722-6240. We are glad we can help if your pet every needs surgery and we look forward to serving you now and in the future.